There are a few researchers I follow closely in an effort to keep abreast of the ever-growing definition of Dyslexia and Dysgraphia. Technology is changing the way we think about these two areas of reading and writing struggle. With the advent of the fMRI (Functional MRI) in the 1990s, neuroscience is providing insight we never had before, helping to shape our understanding of diagnosis and intervention. The greatest take-away from the research is this: dyslexia is primarily a language disorder rather than a visual disorder; dysgraphia is primarily a language disorder more than a fine motor weakness. Knowing this helps us understand that we need to approach reading and writing from a language perspective, rather than with vision therapy and occupational therapy alone--although those therapies may be required in some cases for kids who also have visual or fine motor impairments. This information is relatively new, and is therefore not widely understood. In many public schools, Speech-Language Pathologists can not work on reading and writing and many intervention specialists are not trained in dyslexia interventions. Thus, parents need to fill the gap, providing appropriate treatment, either by educating themselves, or by finding private tutors who understand dyslexia and dysgraphia. In their book, Dyslexia, Dysgraphia, OWL LD and Dyscalculia: Lessons from Science and Teaching, Virginia Berninger and Beverly Wolf summarize the latest research and its indications for effective intervention. As I discuss their book, I will summarize a few salient points and cite important quotes for you. To fully understand dyslexia and dysgraphia, we need to understand reading and writing. When focused on teaching reading and writing, it is easy to forget that all learning reflects the status of the developing brain. 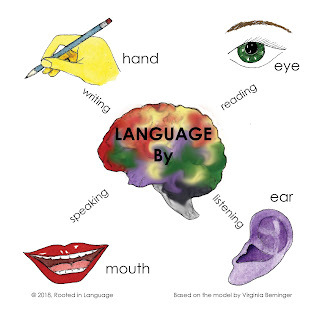 All language is cognitive, and all cognition is neurological. Therefore, we educators must acknowledge neuroscientists and their discoveries. Neuroscience reveals that there are key regions within the left hemisphere that execute reading and writing. 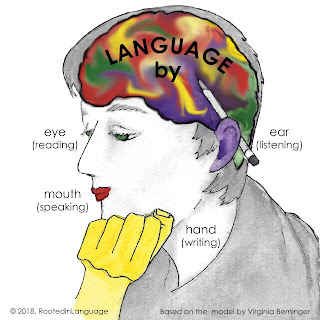 "Broca's area [located on the left side of the brain, near the front] has been shown to house executive functions for all language systems--listening, speaking, reading, and writing" (4). Wernicke's area (located in the left temporal lobe) is the region involved in language comprehension. "According to contemporary brain imaging research, structural and functional differences occur between typical readers and writers and individuals with specific learning disabilities (SLDs) in both Broca's and Wenicke's regions" (4). In addition, scientists have determined the hereditary nature of dyslexia and dysgraphia, manifested in families with various severity levels and learning struggles. Two specific genes have been associated with dyslexia in replicated research studies. "First, genes may affect how the brain is wired during early fetal development" (11). In a conference I attended in 2016, presented by Nadine Gaab from Harvard Medical School, Gaab supported Berninger and Wolf, noting that fetal differences are being observed in her research studies. "Second, genes may affect maturation of the brain after birth by guiding the process of [myelination]"(11), which is the coating of axons needed to transmit signals with more speed and efficiency . In other words, myelination is needed for learning, and this process may be delayed or impaired. Nadine Gaab described this as a weakness in white matter, which acts to communicate between key language regions. White matter is "the information highway" from the front to the back of the brain. Gaab gave the metaphor that weakness in white matter results in an information highway that is less robust and often bumpy. Third, as stated above, "genes may contribute to two core types of impairments typically found in children with dyslexia: phonological and executive function" (11). Another key area of the brain involved in reading and writing is a region in the back of the brain responsible for word-form memory. This region is "where spoken and written words are coded into memory for further processing . . . Children with and without dyslexia differ not only in phonological coding . . . but also in orthographic coding" (11). In other words, children with dyslexia have weakness in both phonological processing (managing sound) for reading, but also in developing the sound-to-symbol relationship needed for writing, and the word-form memory needed for reading fluency, writing fluency, and spelling. One final thought, as this is a lot to take in: There is research supporting the efficacy of multisensory intervention strategies for improving reading and writing, demonstrating that phonics practice is not enough. Reading and writing intervention needs to include phonological processing practice, orthographic (writing) practice, and morphological (word study) practice. These combined interventions result in "chemical activation in the brain" in the key regions of weakness (12). You may have noticed that this summary of recent research was only the most salient points through page 12 of Berninger & Wolf's book. Whew! Dyslexia and dysgraphia are complex problems requiring complex intervention. This is why we break our classes into four parts: Phonics & Spelling (where we show you how we support phonological processing), Vocabulary & Word Study (where we demonstrate strategies to improve morphological knowledge), Grammar & Punctuation (where we help kids connect to other language regions on the information highway), and Supported Writing & Editing (where we demonstrate kind and gentle orthographic training). This is also why, in our Roots Entwined classes, we passionately promote a learning process we call Intentional Copywork and Dictation, in which phonics, spelling, word study, grammar, and comprehension are all taught in mini-lessons, then practiced in writing, week after week. 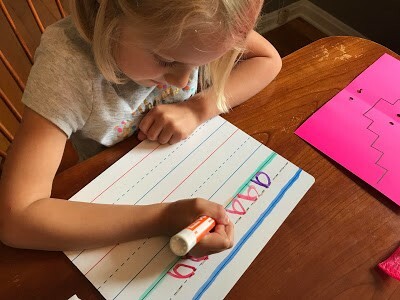 This practice includes all the individual skills of reading/writing (mini lessons) and then works on consolidating them all together (copywork and dictation), which makes for intentional learning. At Rooted in Language, we believe what the research supports: Strengthening all key areas of weakness, through skill training and consolidation practice (as described above) in reading and writing, is the very best way to help struggling learners progress. Our Trees Book Has Many Branches! The New Year often means new plans. This request arrived just in time for the first anniversary of Trees in the Forest: Growing Readers and Writers through Deep Comprehension. It has been a fantastic year, with great sales, allowing us to reduce the price going forward. Thank you to everyone who has supported our launch as Rooted in Language. Thanks to you, we are able to share even more great teaching strategies and tools in the coming year! To answer the question, I have to recap our production, a bit. So bear with me, as it answers the question in full. 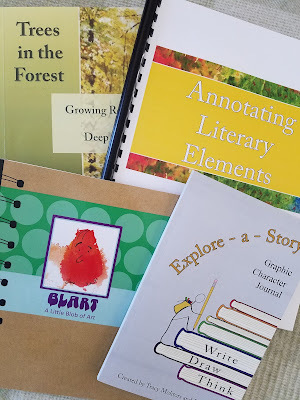 When I wrote Trees in the Forest with Tracy Molitors, I wanted to present an overview of why deep comprehension matters, and include a few of my favorite ideas or strategies for helping kids improve this skill. The book was not meant to be all–encompassing; rather, it was meant to share some great tools to inspire learning. During the book launch, we began to help others expand on the book’s ideas, leading to the publication of Explore-a-Story. Explore-a-Story provides direct insight into how to use one of the book’s methods. We were unable to delve into the concept of annotation within the book, being aware that this complex and important idea would require its own exploration. We originally developed Bookmarks, our tool to aid in annotation, but even that required more instruction. We needed to provide direct lessons, geared to both the independent student or the educator of younger students. So we created a multi-lesson approach to annotation called Annotating Literary Elements. Now all these together combine to make a comprehensive approach to teaching deep reading! This leads us back to Michelle’s question: What order to teach? The educator begins reading Trees in the Forest through the First Tree (the first activity). Try the exercise for yourself, but don’t yet teach it to kids. Teach the Second Tree to your students of any age, and do the activity together. Fully engage in conversation, discussing what it means to “converse with a story,” and how one’s own internal conversation changes the story. This exercise can be repeated with other picture books throughout the year, or each year. Teach the Third Tree, using Explore-a-Story to support writing about characters. This is a Write-Draw-Think activity, so it is a multi-sensory way to explore character. Discussions on the character’s conflict and possible story themes should occur as a result. Use this exercise now and again throughout the year. 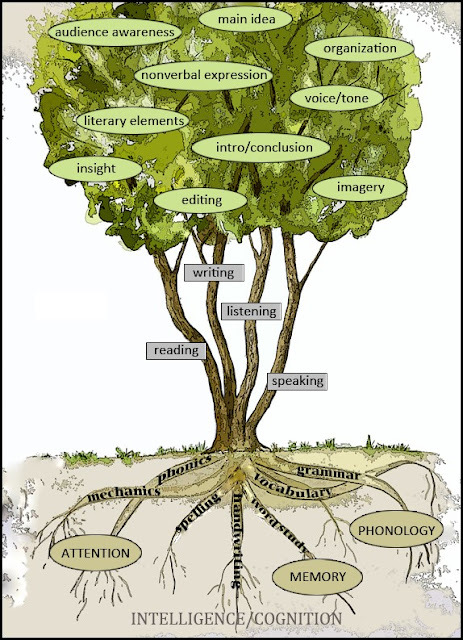 Engage in the Fourth Tree with your students, sharing your writing as a form of poetry. Discuss the writer’s word choice and how chosen phrases came together to create a complete picture. Repeat as often as desired. Listen to our Podcast on Blart: A Little Blob of Art, and then do the Sixth Tree together. Notice how the exercise helps kids elaborate on ideas, as well as discovering theme. Discuss how writers use story to comment on the human experience. Use this method of writing throughout the year on various genres, including movies, poems, short stories, and novels. Use this method to help older writers develop a thesis and write introductory and conclusion paragraphs in literary analysis papers. Listen to our Podcast on Annotating Literary Elements (ALE), and then teach Lesson One. Do not be afraid to spend many months on this lesson, using various pieces of literature. Always engage in this exercise for any literature that will be analyzed in a formal paper. The bits and pieces of writing in this exercise are important warm-ups for both discussion and writing. Teach Lesson Two from ALE. Be sure to revisit this lesson when discussing or analyzing poetry or lyrical prose in the future. Use the vocabulary of Musical Elements when discussing songs, as well. Teach Lesson Three from ALE. You will notice that the exercise in this lesson is the same as the Fifth Tree in the Trees in the Forest book. You are coming full circle in teaching using our materials and ideas. Be sure to discuss how the writer uses images and figurative language to enhance a passage. Revisit the “Colors of the Canopy” lesson in the future, using copywork passages or poetry. Teach Lesson Four from ALE. Take your time. You are putting together many ideas, so it is better to go slowly. This will need to be practiced more than once, so we have also provided a follow-up lesson called Annotation Bookmarks Extension Activity. This will give your students an opportunity to absorb all of the information while applying their knowledge to a ballad poem. If you have younger children, you can teach them how to track literary elements using our strategy called Fishing for Meaning, rather than using the more advanced Bookmarks. Fishing for Meaning is a great strategy we use to help kids uncover and write what is hidden within the depths of a story. You may choose to use a different short story or a current novel for this exercise. Finally, read the Seventh Tree and have your children try the exercise from the First Tree. By now they have gained the tools to analyze text, and they have learned how to capture their thoughts in Bits and Pieces of writing. Once you have worked through all of our strategies for improving comprehension, analyzing literature, and stimulating analytical writing, you can continue these strategies for years to come. As always, we teach our strategies using more simple text, but we help kids apply those strategies to more advanced literature as they mature. And don’t forget, analyzing poetry, videos, movies, commercials, magazine articles, short stories and non-fiction is all a part of creating a comprehensive language arts program, and helping kids learn how to learn! I wrote this draft by hand. Really. I made myself write by hand, then type up this blog for you. I wanted to remind myself of the process, now that I have the skills to generate original writing through the keyboard. When I I talk to groups, parents inevitably ask me questions about handwriting. No matter the topic--handwriting is always a question posed by someone (or many) in the group. It just happened last Thursday when I spoke to a homeschool group in Delaware, Ohio. 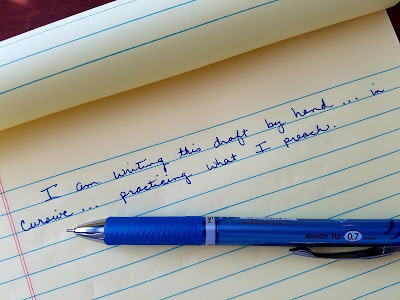 I was soon discussing the hows and whens and whys of teaching print, cursive, and keyboard--and the value of teaching all three through Copywork and Dictation practice. The main point I emphasize is this: there is value in practicing all three forms of writing, value in progressing through all three handwriting stages, and value in not skipping one mode of writing over the other. Research is mounting on the positive benefit of teaching reading in conjunction with writing. Watch our free video on Rootedinlanguage.com called "Welcome to the Forest" to see how we teach new readers to connect their literacy language skills: Say it; Read it; Write it. When it comes to teaching writing--like teaching reading--don't wait for some magic day when your "child is ready." If children are of school age, it is time to teach them to read and write. Bottom line: don't skip cursive. If your child struggles with writing, and it is too stressful or time-consuming to teach all three modes of writing, then skip print. The child with dysgraphia will still learn how to read print (it is everywhere), but will likely fare better with cursive. Convincing a child with dysgraphia to learn cursive is the biggest challenge. If they persevere, my students with dysgraphia all achieve faster, more legible writing with cursive. Of course, I don't need to convince anyone that kids need to learn keyboard. I do need to convince kids to use proper finger position when typing. Proper finger position is the key to becoming fast and efficient typists who don't need to look at their hands. I discourage the hunt and peck method. After all, the ultimate goal is functional typing for college and career. Colleges give students timed online examinations. Worse, they assume the faster the timing, the less likely kids have opportunity to cheat. So kids have to be fast and efficient to perform their best on these tests. One college student recently told me she took an exam with 10 "short answer" essays--each a half page of typing--and she was given 50 minutes to complete the exam. That is five minutes per half page of text! This is not the first story I have heard! Clearly, in college keyboard speed is essential to survival and success. Sadly, even intermediate-grade students are now required to take computer-based state tests. Kids are expected to keyboard essays, as well. So we don't want our kids to be searching for keys when they need all their cognitive attention and effort focused on answering questions or generating writing. Since original thought should always be the primary cognitive load in generating text, the act of typing--or any form of writing--has to become automatic. All writing paths--print, cursive, keyboard--become automatic through the practice of Copywork and Dictation. Copywork practice does for writing what swimming laps does for endurance and technique--it's training. Copywork and Dictation helps all underlying writing skills become stronger, more efficient, and automatic. Even high school students should continue to practice writing by hand to keep their skills sharp and efficient for taking notes in class. This NPR review of a famous study will help you feel committed to helping your kids become excellent note-takers who write by hand. When parents ask if kids with dysgraphia can just skip handwriting, or if kids who struggle to read can just use audiobooks, I encourage them to keep pushing through the struggle. Help kids read and write to the highest level they can achieve. We would never tell our kids, "Why walk if you are going to mostly drive as an adult?" We want our kids to become adults who can walk and drive--ready to live healthy and effective lives. We want our kids to be ready for any situation. After all, one can't walk on a highway, and one can't drive on a forest path. Walking plus driving gets our kids almost everywhere they need--or hope--to go in life. As a young therapist, I realized a sure way to entice kids to learn was through castles. Maybe it is my own romantic enthusiasm seeping in, but most of my students find the Middle Ages interesting Some aspect of this era can usually engage kids of all ages: weaponry, architecture, clothing, art, social systems, history, fairy tales, literature, dragons, geography, video games, travel, and so on. A study of castles exposes kids to new vocabulary words, or should I say old vocabulary words, which is a great opportunity for Word Study. I remember once a young student and I studied the word helmet, discovering the word helm, as well as the <-et> diminutive suffix. Castles and kingdoms are great for teaching history, but even better for teaching the history of the English language. Here are a few words that intrigue me for Word Study, all explored through my recent travel adventure. According to many sources, our language began with a language known as Proto Indo European (PIE). This language souce spread, as people spread, throughout the Mediterranean and Europe, into India, the Baltics and the Middle East. It arrived on an island, now called Great Britain, via a people now called the Celts. These tribes were conquered by the Romans during the Roman Empire. That is where my journey in York begins. In England last month, we visited the wonderful town of York, which is about a two-hour train ride north of London. 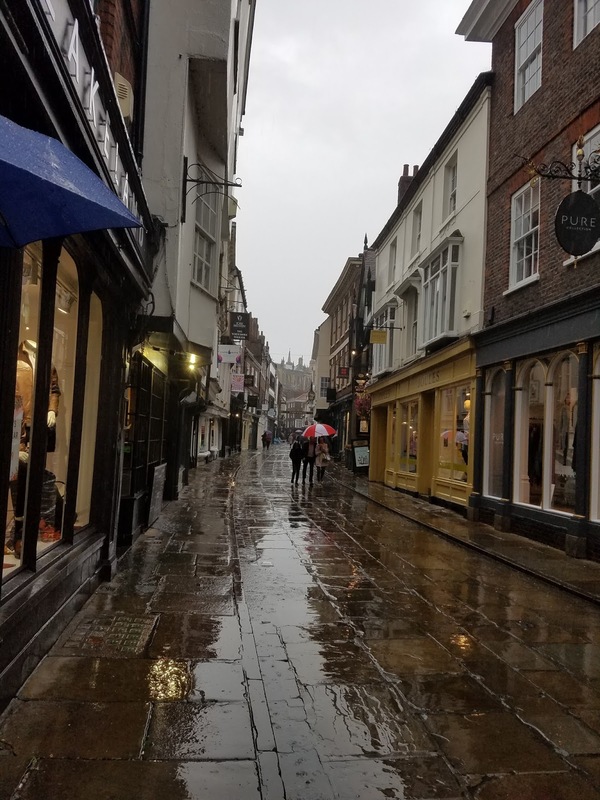 Walking the streets of York is like walking through the history of the English language. It is a city built by many, and it still has the city walls and town gates to prove it. At one time, York was the “second city of the realm,” according to one brochure. York began as a fortress, built by the Roman 9th Legion in 71 AD (now referred to as CE). York's earth ramparts were raised by the Romans, and Constantine was pronounced as emperor in York in 306 AD. Constantine spread Christianity through the region.The arrival of Monks brought the Bible, which was written in Latin so those religious words entered our language, as well as other ancient Romans words, such as street, mile, and cheese. York was called Eboracum back then, and ancient Roman foundations are still evident throughout the city. When the Romans left England--they had to hurry home since their Empire was collapsing--the area was vulnerable to invasion. Three Germanic tribes (carrying Germanic languages) invaded England, known as the Jutes, the Saxons, and the Angles. We tend to refer to these tribes collectively as the Anglo-Saxons. These tribes pushed the native Celts into Wales, Ireland, and Western Scotland, helping to eradicate that language from English, leaving only the Celtic words London, Avon (meaning river), and crag behind. Since the Angles had more land, the country was named Angle-land, and eventually England. Their Germanic language merged into what we now call Old English. Most of our current, everyday, peasant words are Anglo-Saxon, such as work, house, and the. Soon enough, the Vikings from Norway and Denmark arrived on England's shores, and they renamed this Roman fortress town Jorvik or Yorwik, which we now call York. The Vikings conquered and ruled the northern region for a brief period of time, adding a few Norse words to the English Language, such as get, want, and sky. In York, we walked down a main road called Stonegate, an old street in York that once lead to the gate of the old Roman fortress. 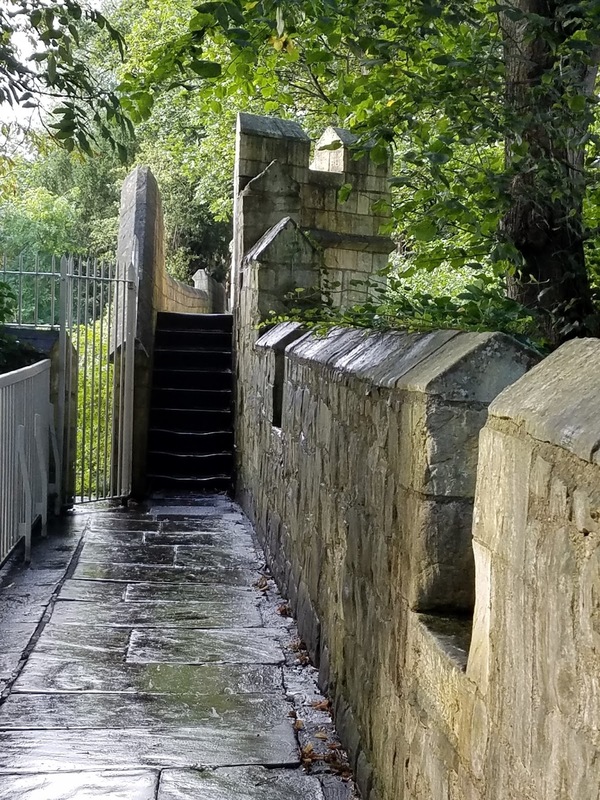 Gate is a Viking word for street, so we walked along many gates throughout York, such as Castlegate and Monkgate, to name a few. 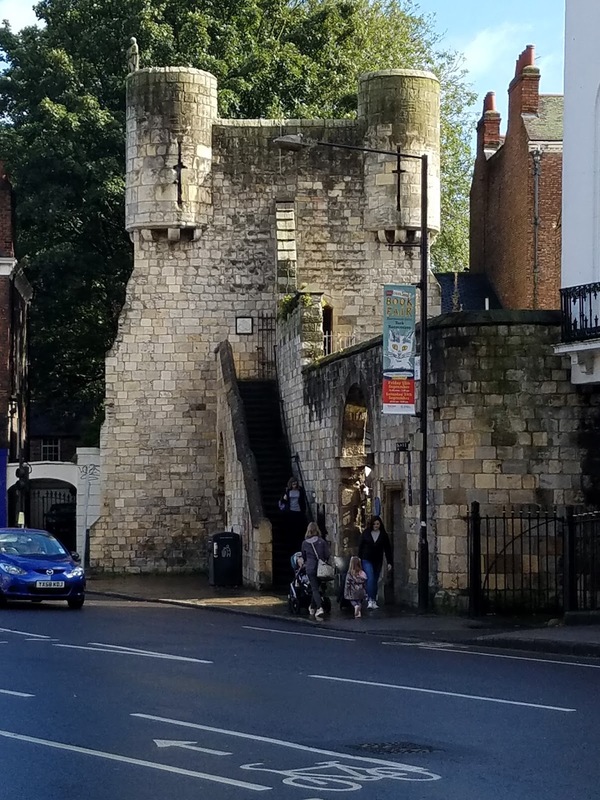 York survived and thrived through all of this, even when the Normans (from a northern region of France) arrived in 1066 AD. I tell my students we can blame a man named William the Conqueror for adding French, with its complex spelling patterns, to the English language. 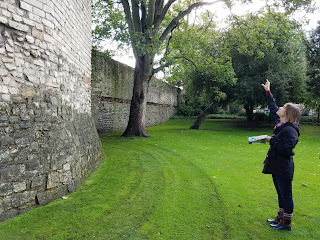 The Normans fortified York’s city walls, adding their signature to this historic city. During their half- century rule, the French Normans added many government and military words to English, giving us a confusing spelling for the word we now pronounce colonel! 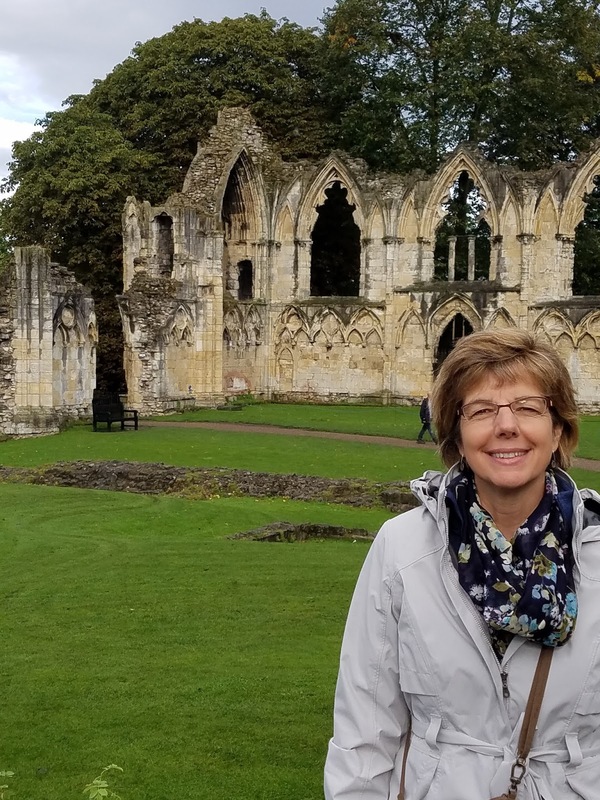 The city of York flourished during the Medieval period--a time of kings, wars, feudal lords and peasants. During this period, the walls were reinforced so well, that they still encircle York today. 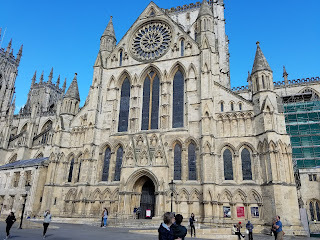 By the time the Tutors took control of the throne, York's cathedral was completed. 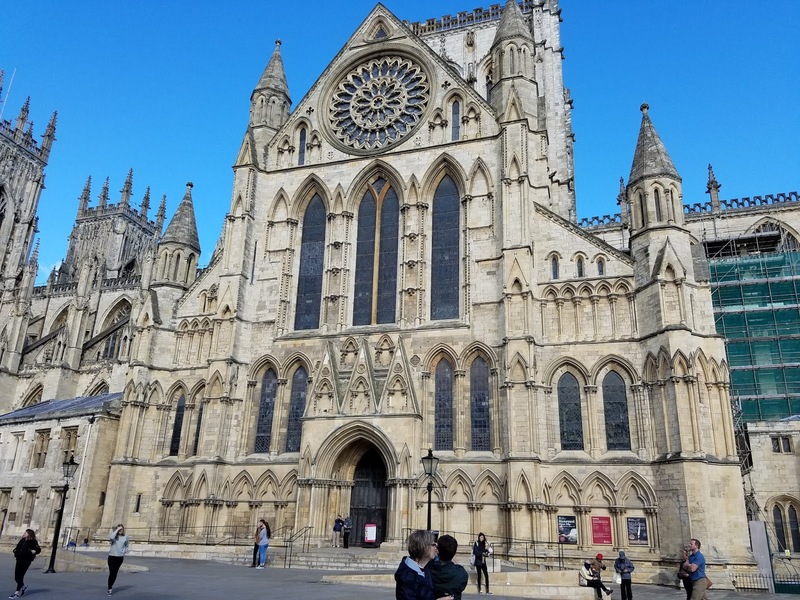 The beautiful York Minster took 250 years to build! Cathedrals were named for the cathedra or throne of the Archbishop. A Minster was a center of learning or ministering, which differentiated it from an Abby. There are remains of an Abby destroyed during the religious wars between the Catholic and Protestant rulers. The printing press brought a literary age to all of England during the Renaissance period. The press forced printers to settle on spelling conventions. While the printing press solidified spelling, it did not control the ever-morphing pronunciation of words. Thus the once voiced /gh/ in right and /k/ in knight are now only seen, but not heard. Meanwhile, Shakespeare was wooing audiences in London, adding new words to the English language at a remarkable rate. Classical works were available to all, so Latin and Greek had a profound influence on English language growth. York shared its name during the Colonial period, as a New York was established in America. Meanwhile, Britain's York was turning into a fashionable resort, with Georgian buildings built in the 18th century. (This is a good time to remember “crazy King George” and the American Revolution.) Loan words entered the English language, through the French, Dutch, and Spanish. Food, animal, and plant names were added to the lexicon, growing English into the largest language in the world.! As English spread to many nations, pronunciations and dialects varied across the globe. York even had a prominent place in the Industrial Revolution, with its historic train station and train museum. Again we see how industry, and now technology, have added even more words to our ever-growing English language! Today, the lovely town of York is a popular tourist attraction. 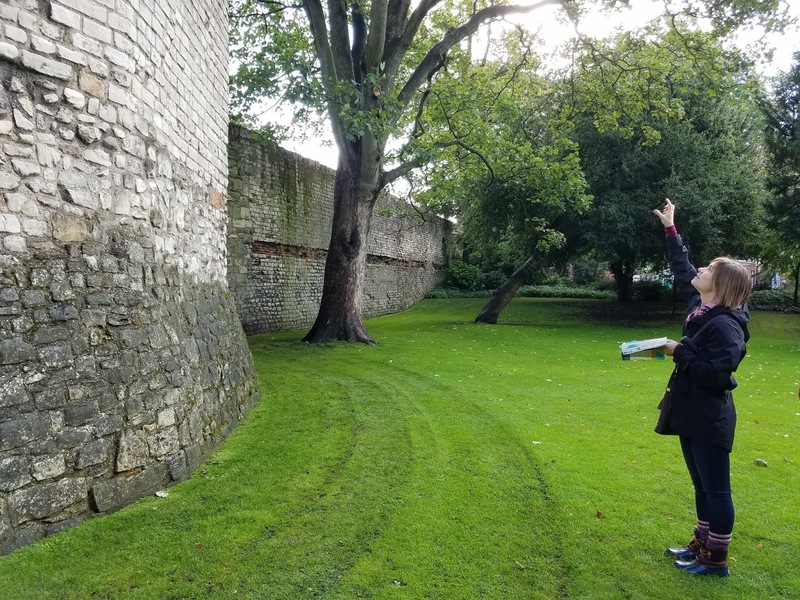 Tourists, who continue to share and spread words around the globe, can enjoy York's walk through the history of English. We walked along the ancient city walls and climbed up into the Bars. Bars were four city gateways, each containing a portcullis. One of them still has its barbican, or funnel-like approach, which forced attackers to bunch together if they tried to invade the city. Bars welcomed monarchs and displayed the heads of traitors! The point is, I learned a new word which led me on a Word Study journey . . . When I educated my children, we didn’t have the money to visit castles and ancient towns, but we visited them in our history, literature, picture books, encyclopedias, myths, and media. I remember we all wondered over the spelling of the word Medieval. Why the <ie> vowel team and the <al> ending? If only we knew then what we know now: investigate words using Structured Word Inquiry! Medieval literally means the Middle Age, and it has nothing to do with being an <evil> time, as I thought as a child! So you see, castles and Word Study really are good bedfellows!